The Retreat at Groenfontein is breathtakingly beautiful. The surrounding Swartberg mountains, multiple walking trails, abundant birdlife, the dam and river and the stillness are all complimented by the sense of care that Marie and Grant bring to their “retreat”. The traditional home-cooked meals and the connection created with other guests by the communal eating style left us as a family feeling so blessed to have experienced this haven in the Klein Karoo. This is a truly special place for relaxing and unwinding, Karoo-style. The Retreat at Groenfontein is a charming Victorian farmhouse set in the scenic, tranquil Groenfontein Valley Conservancy, 20 km from Calitzdorp in the Western Cape. Bedrooms open onto garden patios, while the lounge and dining room, each with a fireplace, open onto the verandah overlooking the sweeping garden and majestic Swartberg mountains. Grant and Marie treat guests to hearty breakfasts and home-cooked dinners. 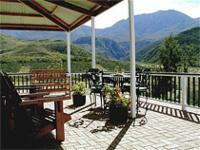 Peaceful walks in the country or climb the foothills of the Swartberg. Pool. Solar power. AA Hall of Fame 2006 to 2010. Children under 12 can eat before the adults in the evenings before enjoying a DVD while their parents have dinner. 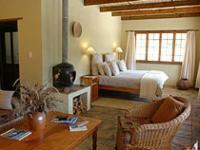 Kids under 12 stay in the suites for R80 each, including supper, bed and breakfast. A third adult in the suite is R360. Children of all ages as well as pets are most welcome. "We were astounded at this absolute "gem" hidden away in this amazing valley. Unfortunately we only used it as a stop over, we will definitely be back for a longer stay"
"It was a very good enjoyable quick stay. Very remote and sadly didn't have time to walk the area. But please note it's a good 40 minutes on a dirt road from the N2. The road is very well maintained." "A truly memorable experience. First rate in all aspects." 20 Km North East of Calitzdorp on Groenfontein Rd or 29 Km on Kruis River Rd from R62. (Both untarred roads). S33° 26' 15.6" E21° 47' 20.9"